Wondering if Unpackanize© is right for you? “I just moved from Dallas and the movers packed for me! It is a hot mess. I am working night shift and going to school full time so I could really use some help unpacking and organizing my whole apartment.” ~ Kelly H.
For Kelly, we were able to get her unpackanized in one short afternoon, and because she works the night shift, she slept at her brothers house while we worked. When we were finished, we created videos for her explaining where everything was so she wasn’t lost in her own home! “We recently moved into a new 5 bedroom house after our last house flooded. We would like help getting everything unpacked and organized starting with the office…” ~ Rick B. We ended up unpackanizing Rick’s entire home, one room at a time with a crew of up to four organizers at a time. It took a few weeks between their schedule and ours, but it was a manageable pace for them. The final place was the garage and it is a beauty! Everything that they no longer wanted, was picked up by Salvation Army. 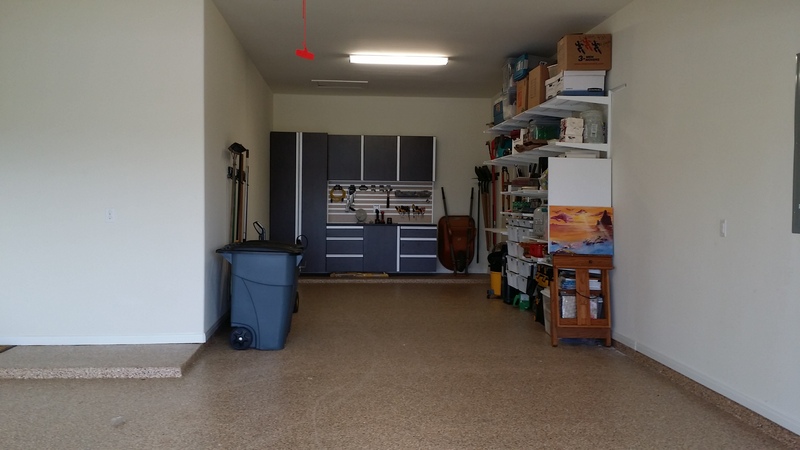 Imagine this is your garage after a big move – clean, organized and clutter free! We came back at Christmas to help get down the Christmas decorations, then back later to pack it all up and put it away. “I recently had to downsize into an apartment. I need help figuring out where everything can go so I can work on my passion jewelry making!” ~ Debbie S.
Debbie had moved to start fresh after a divorce and was overwhelmed. Her mobility was limited due to a recent surgery so we made sure to keep her physical condition in mind as we put things away. We quickly unpackanized her things so she could find everything, making her new apartment more like a home. “She has helped me move and worked with the movers both packing and unpacking. I’ve moved many times throughout my career and these were the smoothest ever. Her methods of organizing are clear and easy to keep up.” ~ Karolyn G.
Karolyn has been a client of Katy Home Organizer for many years. She’s downsized all of the contents in her home to start fresh in a new place. Later she got married and had us unpackanize and merge their households so it all fit into the new home. Then one more time after another move. As you can see there are many different scenarios that brought people to us where Unpackanize© was the solution. The joy and contentment we have brought to these clients, we can bring to you as well. Give us a call! Katy Home Organizer & Unpackanize© brings you from clutter to clarity!